Scott isn't here this week, and at least as far as Burn Notice is concerned, he might have taken all the joy and excitement in the world with him, practically snuffing out the light of the sun for good measure. I'm not going to go so far as to suggest that the people at USA scheduled this episode for tonight just because they somehow got wind that a understudy would be watching. That would be paranoid. It's funny, though. I've hardly made a secret of the fact that I'm kind of sick of watching Sharon Gless, and here she is, doing that thing where she instantly identifies with a client who "married the wrong man", and in the process makes Michael feel that much more for the both of them, almost as if someone were deliberately trying to bore me to death. I'm sure it's just a coincidence. Sometimes, though, like when Mark Sheppard guest stars on every third TV show I watch, I feel like my enemies will stop at nothing. But enough about me. You want to hear about Burn Notice. You remember the big moment at the end of last week's episode, when the gang found Jacob, the guy who impersonated Michael as part of the scheme to leave him holding the bag for the murder of Grant Show? You're probably eager to find out what that's all about. Your eagerness is not shared by the producers or writing staff. Michael and his friends do track Jacob down to his loser's lair, and to show what good sports they are, they even continue to pretend that he and Michael both sort of look alike. But Michael, even though he's sweating it out waiting to see what's going to happen to him next, is in no rush to just kick the door in and start repeatedly kicking Jacob in the nuts until he becomes deeply informative. He thinks the best way to handle it is to stick Sam and Fee in a car parked outside Jacob's place for two days, presumably so that if the people who want to frame him for murder get impatient and decide to just kill him instead, he won't have the distraction of backup. When you're a spy, you just know when the time has come to make your move, and Sam and Fee realize that their time has come when a bunch of Latino thugs show up and lay siege to Jacob's house. The two of them rescue Jacob and deliver them to Michael, but even though Jacob is grateful, there isn't much he can tell Michael about the people who hired him, and now presumably want him dead. He doesn't usually impersonate people he looks nothing like in order to help frame them for murder, but in this case, he answered an ad on the Internet. "I had no choice," he says. "Construction's dead." So Michael sets Jacob up at his pad and waits for the mysteriously employer who kills own his employees to check in with him. While he's waiting, he has enough time on his hands to help Diane, who Sam's current unseen lady friend met through his work with a women's aid society. Denise needs aid because her husband, John, has been "different" since his brother was killed fighting overseas and has now absconded with their son, Timmy. Michael and Sam go pay the guy a visit. While Michael is in the living room talking a blue streak about how he sympathizes with his situation and has nothing but respect for deadbeat dads rendered dangerously unstable by the death of a loved one in uniform, Sam sneaks around the back and decides to break into the tool shed. "New lock, huh? What're you hiding in here, pal?" he says aloud to himself, as if he were in a damn comic book. Showing the clumsiness and total lack of smarts that the master operators on this show have been known to demonstrate when the writers are too lazy to find another way to move the plot forward, Sam just barges into the shed, triggering the motion sensor you knew was in there and cuing Crazy Dad to grab little Timmy and hightail it to the safety of the compound where his well-armed militia buddies are holed up. I sometimes think that, if I could enforce one rule on Burn Notice with a mind towards helping the show tone up, maybe it wouldn't be "Have Mom fall in the shark tank at Marineland" or "Get Jeffrey Donovan's mouth surgically tightened so he doesn't have Napoleon Dynamite teeth." I think it might be, only cast the scary-villain roles with actors who can pass for dangerous. It's not that the show has never hit the jackpot there, but when it drops the ball, the loss of tension and suspense can be so crippling that nobody seems to be trying. It soon becomes clear that Militia Dad isn't going to be scary, and this turns out to be by design: God forbid that someone with offspring and a brother who died in service to our country be the villain. The real bad guy is the oddly named Zechariah, the militia leader (and, the show takes great care to point out, not someone who has served in our nation's military), played by W. Earl Brown. I'm all for W. Earl Brown, who played Dan Dority on Deadwood and was great last year as a jailed prisoner who takes a hostage in an episode of Justified. 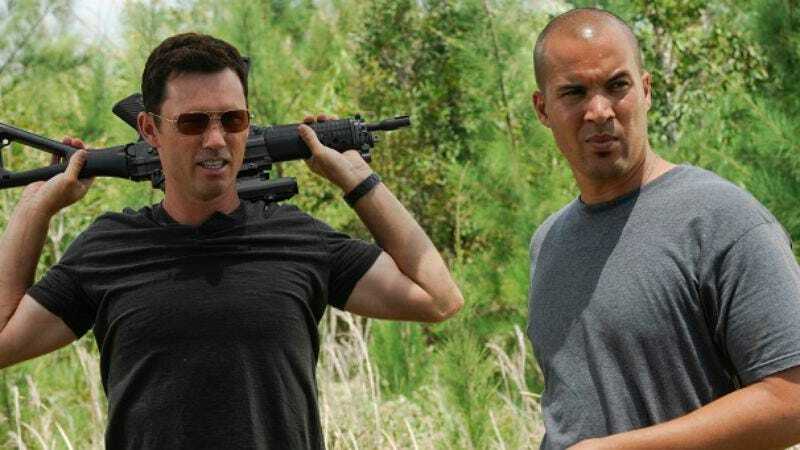 But, however proud the Burn Notice people must be of having found an actual heavyset person with a Southern accent to play a militia leader, he's miscast here. Brown was so effective in those previous, better-written redneck killer roles because of the sleepy, surface affability that partially concealed his willingness to snap someone's neck, if he were told to, or thought he had to. Here, he's supposed to be maniacal, and he doesn't have it in him: ranting things like, "I am the hand of God! I am the righteous soldier," he just looks like an out-of-shape National Guard volunteer enjoying a weekend in the woods to get a break from the wife. Maybe the idea is to expose these apocalyptic gun nuts as fundamentally lame dudes, but if that was the idea, and they aren't meant to be scary, their bluster ought to be funnier. Here, Smith isn't that, either. It was easier to buy him as Meat Loaf. It's a classic action tearjerker moment: as Michael and the father exchange looks, and then Michael scoops up the kid and makes a break for it, it's clear that everyone knows the father is sacrificing his life but is putting a brave face on it. Then Michael is briefing Denise, and after she says something about how she has to feel for her ex-husband, knowing what he went through, Michael says, "It's a miracle he got out of the compound, but he's checked himself into a hospital, and he's gonna be okay." It's moments like this that used to inspire Elvis to shoot out his picture tube. Next week: Michael has to turn for help to Fiona's old flame, played by Gavin Rossdale. It's news like that that used to inspire Elvis to reload. Now that they've got Bruce Campbell in fighting trim, it sure would be nice if the show could give him something to do besides talk about his invisible girlfriend and break into tool sheds. His other great function tonight is to state and restate the obvious. When Michael says, "Why does it look like someone spent some time and money fortifying Jacob's home? ", Sam replies, "Because someone spent some time and money fortifying Jacob's home." When Fiona points out that the bad guys need special equipment to do something they've just done, Sam says, "I'm pretty sure they have it." It must be a fast way to write dialogue, I'll give them that. This is the second episode in a row that's included a gratuitous wisecrack about Bruce Campbell's chin. Did somebody lose a bet? Jacob has a small dog named Mr. Pickles, which helps to instantly establish him as a hapless dweeb, but is also kind of stupid. Doesn't everybody know that "Mr. Pickles" is a cat's name? This week's caption contest: the team knocks out a bad guy, and then, in the instant before the scene fades out, Jesse looks at Fiona and points at the guy sprawled on the ground, and Fiona shakes her head. Anybody got a theory about what these gestures are supposed to mean? "Hey, you want to go first?" "That's okay. I'm not really hungry."